The intersection of 20th Street, Lakeside Drive, and Harrison Street adjacent to Snow Park is not currently friendly to pedestrians or park users. The Lake Merritt Master Plan calls for this intersection to be reconfigured to calm traffic, create safer pedestrian crossings, add bike lanes, and increase park space. For a PDF of the Project Concept Plan and information, click here. 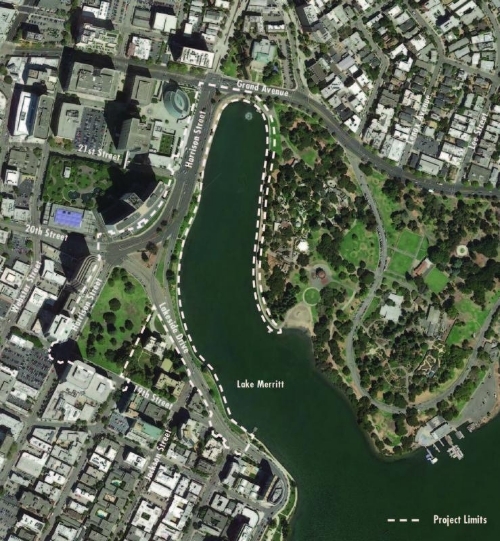 For more information about the Lake Merritt Master Plan, click here. To ensure pedestrian, cyclist and motorist safety during the first phase of the project, the following crosswalks will be closed through summer 2017. 2) Roadway Closures: Thomas Berkely Way between Harrison St. and Lakeside Dr. is closed for good and will become a pedestrian promenade. Vehicles can now travel south from the new intersection at Harrison St. on Lakeside Drive. Construction for the total project is expected to run through summer 2019.